Yes, I know, the title of this post is a little misleading. Harry Potter, the famous fictional boy wizard from the J K Rowling novels, never met Gerald Gardner, the father of modern pagan witchcraft, and neither did he visit his Wiccan coven at the sleepy English village of Bricket Wood. The picture above is a Photoshop illusion too, rather than real magic. 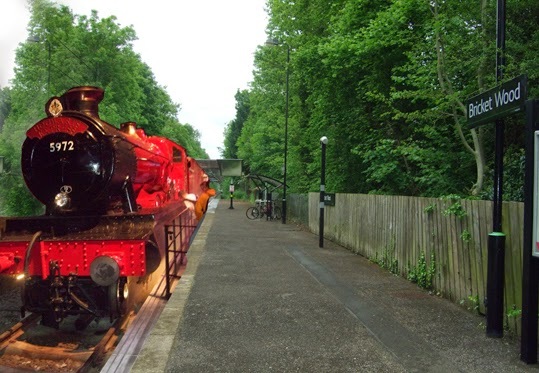 The Hogwarts Express has never pulled up at Bricket Wood station, as far as I know. 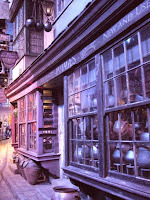 I cobbled the image together myself after visiting the station and then going on the Warner Brothers Harry Potter Studio Tour. Because, you see, although these two icons of modern magic are worlds apart in terms of reality and fantasy, their legacies are just down the country lane from each other. At first glance too, the two locations couldn't be more different. 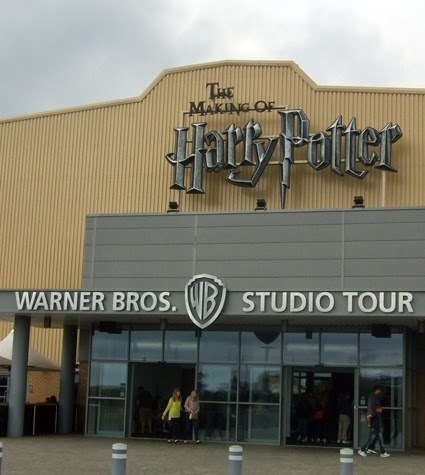 Warner Brothers Harry Potter Studio Tour is a massively popular and well advertised tourist attraction showing the sets, costumes, models and monsters that appeared in the movies based on the fantasy novels and also giving a glimpse into how the films were made. Bricket Wood does all it can to hide its witchcraft history. It has no museum of witchcraft (that’s in Cornwall) and no shops selling pagan paraphernalia (you need to head into central London for them). Even Bricket Wood’s houses – neat mid-20th century bungalows and terraces with immaculate gardens – look more Privet Drive than Hogsmeade. "During the 1930s the area became popular with naturists after Charles Macaskie set up a naturist camp on the outskirts of the village. Naturists bought up plots of land on the edge of the village and built their own communities... 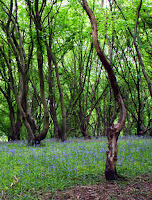 The village also began to attract Wiccans after Gerald Gardner set up Bricket Wood coven." Actually, the coven often met inside the naturist camp, in an old so-called "witches' cottage" in the club grounds. 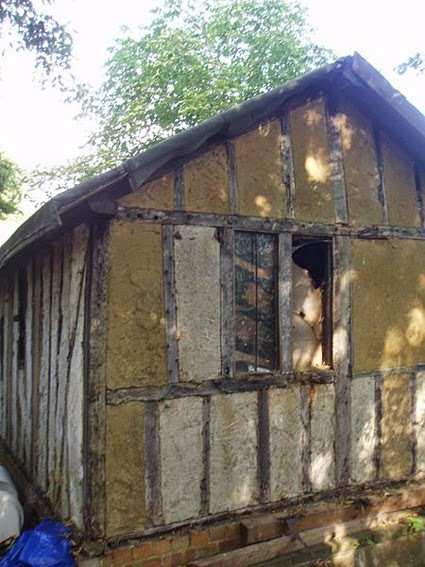 Gerald had bought the 16th-century cottage from a friend, Freemason John S M Ward, who was a pioneer of the restoration of historical buildings. Yet here is where the knowledgeable observer starts to see a little similarity between the fictional world and the real world. Gerald's witches' cottage actually looked very much like the one created by Warner Brothers as Harry Potter’s parents’ home. You can see the pictures of both of them here. 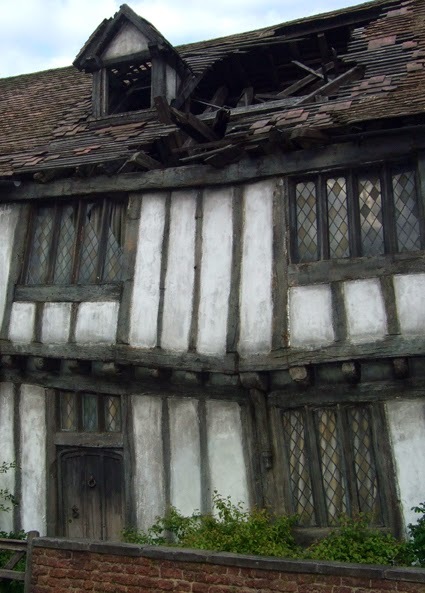 The one on the left shows the real witches' cottage and the one on the right is a photo I took on the studio tour. The naturist club is still there. I’ve never been inside, but the gates at the entrance bear just a slight resemblance to the movie set gates outside Hogwarts School of Witchcraft and Wizardry – which you can see on the studio tour. On the other side of the village, on Bricket Wood Common, is where I felt the greatest sense of the numinous, when I walked into woods that could have been part of the Harry Potter set. 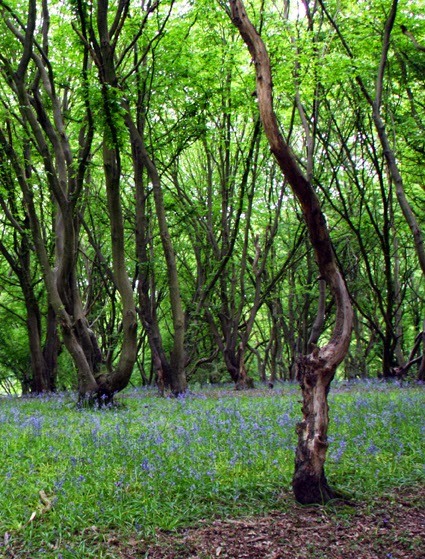 The forest floor was, in places, a carpet of bluebells and their scent filled the air. 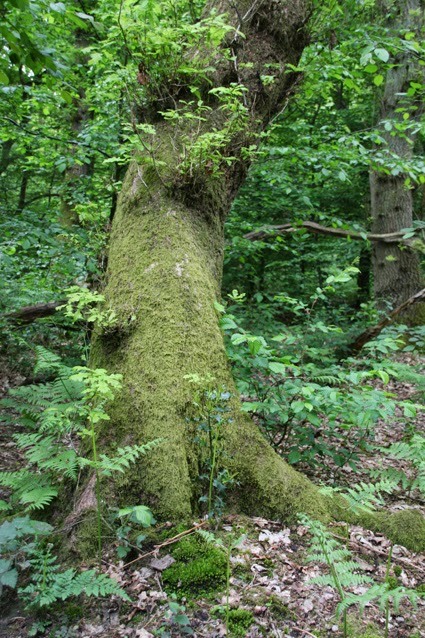 In other places were gnarly, moss-covered oak trees, twisty hazels, blossom-covered hawthorns and dappled light from beach groves falling over stands of green ferns and tiny saplings pushing up through layers of old leaves. Birds were singing, squirrels darted from branch to branch and at one point a young deer ran across the path in front of me. If you want to experience the magic of nature, it doesn't get much better in my opinion. 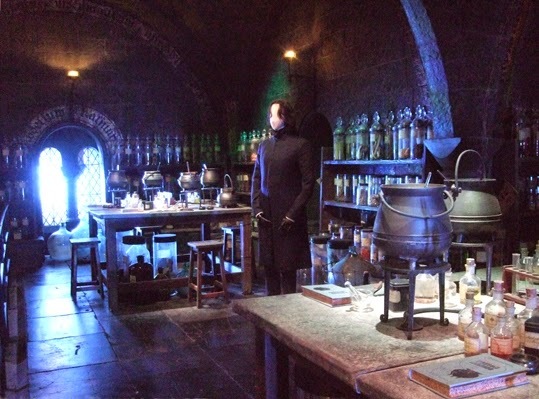 "As the books were still being released while the films were being made, the production crew saved many of the iconic sets, props and costumes that were created especially for the films - just in case they were ever needed later on in the series. Once filming wrapped on Harry Potter and the Deathly Hallows - Part 2 in 2010, the production crew were left with a treasure trove of thousands of intricate and beautifully-made artefacts, many of which wouldn't have been saved on a typical production. The team behind Warner Bros. 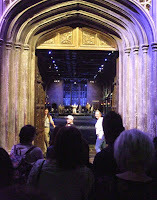 Studio Tour London - The Making of Harry Potter wanted to preserve and showcase these iconic props, costumes and sets so that Harry Potter fans could experience the magic of filmmaking first-hand. Many of the original cast and crew returned to reassemble the sets and record their memories from filming... Set adjacent to the working film studios where all eight Harry Potter films were made, the Studio Tour offers visitors the unique opportunity to explore two soundstages and a backlot filled with original sets, animatronic creatures and breathtaking special effects." It is breathtaking. You can wander through Hogwarts' great dining hall and down Diagon Alley and also see other locations just as they were depicted in the films: the Gryffindor common room, the dormitories, Dumbledore's study and the huge dungeon where potion classes took place. You get to see props and costumes close up and learn a few secrets about how they were made and how the illusions of magic were created. A recent addition to the exhibtion is the Hogwarts Express, which you can climb on board and experience a scene from one of the movies. Photography is welcomed in most parts of the tour - though I'm not sure how happy the folks at Warner Bros will be with my poor attempt at Photoshopping the picture I took of the famous train. If you want to find out about the Warner Bros Studio Tour, here is the website: http://www.wbstudiotour.co.uk/ You can order The Complete Harry Potter Collection of books via Amazon and also rent the movies. One of the best history books about modern witchcraft is The Triumph of the Moon: A History of Modern Pagan Witchcraft. The photo of The Witches' Cottage, a hut in Bricket Wood used by Gerald Gardner and his Bricket Wood Coven to perform rituals during the mid-20th century, is by Sunblade1500 and shared under Creative Commons. The rest of the photos on this page were taken by myself.